Piles of discarded refuse litter the landscape in many of Arnold’s classic compositions: automobile tires are heaped into newly crevassed canyons in Entropic Landscape (1999) and discarded household items accumulate before they head to the local landfill in Things Being what they Are (2007). 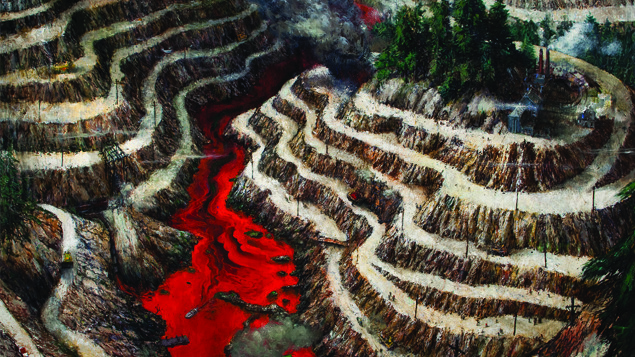 In another series of paintings, Arnold challenges what he considers to be the scurrilous activities of the mining and logging industries by depicting massive strip mines in On Earth as it is in Heaven (1997) and vast deforested landscapes in Turnover: Tilling the Soil of Their Undoing (2006). Arnold was born in Southern California in 1952, but he spent a significant portion of his childhood in Munich, Germany where he was exposed to the Romantic landscape paintings of European painters including Caspar David Friedrich, Pieter Breughel the Elder, Théodore Géricault, and Max Beckmann. While Arnold’s dramatic style of narrative realism places him within the art historical tradition of the Romantic sublime espoused by these artists, Arnold reinvigorates the genre by offering poignant commentary on contemporary sociopolitical issues.